You can't be scared of heights if you wish to enjoy the splendour of the No 35 restaurant. This place is truly for those who literally seek the high life. The No 35, or "Number thirty-five" derives its name from its lofty location on floor thirty-five of Collins Street's Sofitel. Its interior is made up of contemporary artwork that's become a part of Melbourne culture. It is the aim of the No 35 restaurant to ensure that all its food and service remains just as high in standard as its location. 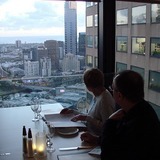 With its Asian, European and Middle Eastern dishes, all patrons will enjoy a memorable dining experience as they are spellbound by the views of Melbourne. The eating area is brightly lit and this only seeks to add to the thrill. It is not uncommon for visits to this restaurant to last many hours at a time, especially at night when the numerous guttering distant lights are observed.